Windows 8 constantly searches for a working Internet connection. If it finds one that you’ve used previously, you’re set: Windows passes the news along to Internet Explorer, and you’re ready to visit the web. When you’re traveling, however, the wireless networks around you will often be new, so you’ll have to authorize these new connections. Whenever you want to connect with a new network, you need to tell Windows that you want to connect, please. Summon the Charms bar and click or tap the Settings icon. Mouse: Point at the screen’s top- or bottom-right edge; when the Charms bar appears, click the Settings icon. Keyboard: Press Windows+I to head straight for the Charms bar’s Settings screen. Touchscreen: Slide your finger inward from the screen’s right edge; when the Charms bar appears, tap the Settings icon. Click or tap the wireless network icon. Available: When the icon says Available, like the one in the margin, you’re within range of a wireless network. Start salivating and move to the next step. Unavailable: When the icon says Unavailable, like the one in the margin, you’re out of range. Time to head for a different seat in the coffee shop or perhaps a different coffee shop altogether. Then return to Step 1. Click or tap the Available icon if it’s present. 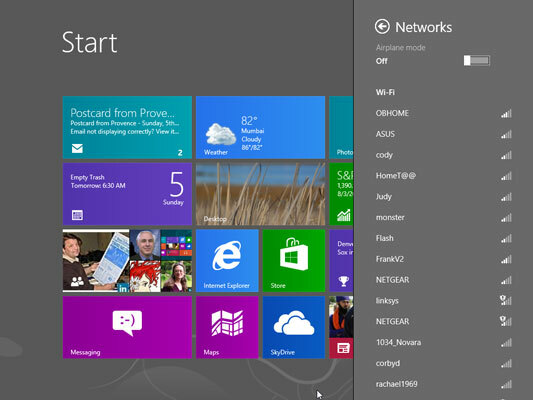 Windows lists all the wireless networks within range of your PC. Don’t be surprised to see several networks listed; if you’re at home, your neighbors probably see your network listed, too. Choose to connect to the desired network by clicking its name and clicking the Connect button. If you select the adjacent Connect Automatically check box before clicking the Connect button, Windows automatically connects to that network the next time you’re within range, sparing you from connecting manually each time. Enter a password if needed. If you try to connect to a security-enabled wireless connection, Windows asks you to enter a network security key — technospeak for password. If you’re at home, here’s where you type in the same password you entered into your router when setting up your wireless network. If you’re connecting to somebody else’s password-protected wireless network, ask the network’s owner for the password. If you’re in a hotel, pull out your credit card. You probably need to buy some connection time from the people behind the front desk. Choose whether you want to share your files with other people on the network. If you’re connecting on your own home or office network, choose “Yes, turn on sharing and connect to devices.” That lets you share files with others and use handy devices, like printers. If you’re connecting in a public area, by contrast, choose “No, don’t turn on sharing or connect to devices.” That keeps out snoops. If you can’t connect to the secured network you want, try connecting to one of the unsecured networks. Unsecured networks work fine for casual browsing on the Internet. Cordless phones and microwave ovens, oddly enough, interfere with wireless networks. Try to keep your cordless phone out of the same room as your wireless PC, and don’t heat up that sandwich when web browsing. If your desktop’s taskbar contains a wireless network icon (shown in the margin), click it to jump to Step 3. While you’re working on the Windows 8 desktop, that wireless network icon provides a handy way to connect wirelessly in new locations.